1. Please wear the casual clothes (easy and convenient). 2. Please bring your own swimsuit or you can wear it in advance. Pick up from the hotel to the pier at 7:30 a.m.
Move on to Koh Mae Koh in Angthong National Marine Park by kayaking. Have a lunch on the ship. Move on to Koh Wau Ta Lap in Angthong National Marine Park by boat. Leave from Angthong National Marine Park. Go back to the hotel in Koh Sumai. Angthong National Marine Park- Located 19 miles northwest of Koh Samui, including a total of 40 islands, where was declared the sea National Park in 1980. It maintains the natural and pure environment, there are many natural caves, white sand beach, coral reefs and all kinds of rock. 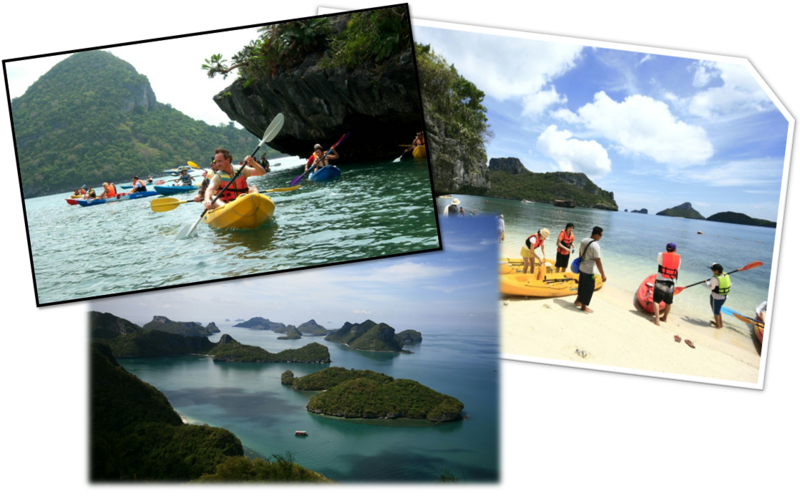 The sea canoeing adventure has become increasingly popular in Angthong National Marine Park. Koh Mae Koh- Is part of the Ang Thong National Marine Park. Koh Mae Koh is a must to visit. There is a swimming beach as well as the stunning Thale Noi, a wide turquoise saltwater lake bordered by sheer cliffs. Koh Wau Ta Lap- It is a quiet island of coconut trees, extremely few tourists, come to this island you can feel a comfortable, and there is a typical tropical landscape.